Here in the Home Decor section of the Zombies Playground, you'll find all of the smaller sized items that are perfect for adding a distinctive and decidedly zombie touch to your home's appearance. Some of them are creepy, some of them are funny, and all of them are zombified. You'll find all sorts of impressive and intriguing little items here, ranging from the mildly mundane to the impressively outrageous. You'll find typical home decor items here like bowls, candles and holders, and posters, all featuring an impressive zombie style. And you'll find other, more esoteric items here as well, like body bags and warning tape. And don't be surprised if you see a zombified garden gnome or something equally strange here as well. Basically if you can hang it, display it, and show it off in your home while creating a distinctive zombie style, its definitely an item that you could find here in the Home Decor section of the Zombies Playground. Sometimes, a zombies bite can be a good, or at least, a helpful thing! 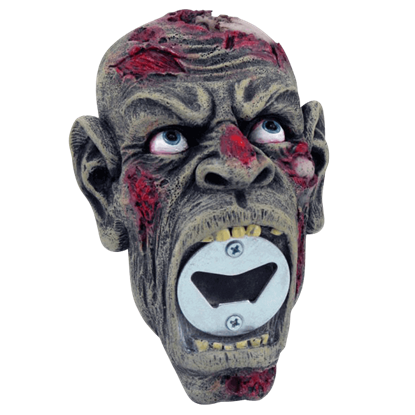 This Biting Zombie Bottle Opener is proof, as this zombies bite is a handy helper that allows survivors to easily get annoying bottles open with ease. Just when your tree thought, it had seen the last of axes, here comes another one to hang on it. 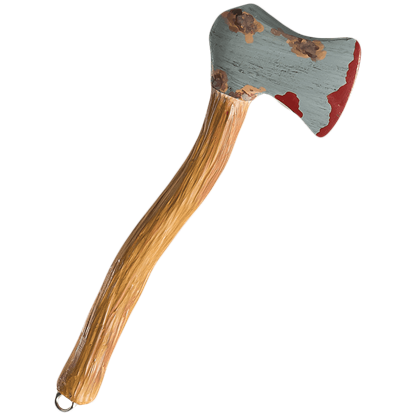 The Bloody Axe Horror Ornament may have been used for more than just chopping wood. Hopefully, its owner does not come looking for it. 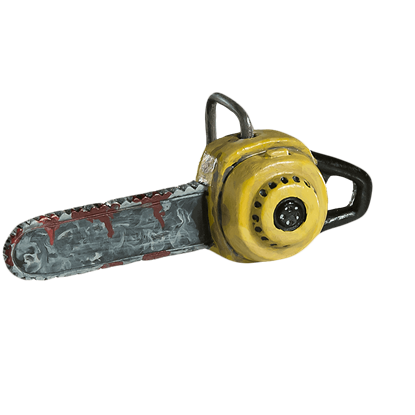 The Chain Saw Horror Ornament has been used to cut up something other than trees. If you were wondering how the severed arm and leg ornaments came to be, then look no further than this grisly device, subtly splattered with blood. This gruesome bust recreates the look of a zombie in impressive detail. You could say that this Decayed Zombie Head is quite lifelike, as well as quite safe, as this zombie head will not start snapping at those who get too close. With a zombie emerging from its top, this From the Grave Zombie Box is a morbid and frightening container, one that you will find to be quite secure. After all, no one wants to reach towards a hungry zombie, fresh from the grave! Ghouls, drinking human adult beverages? Not on your life! 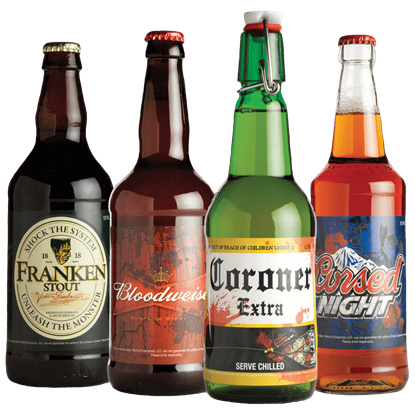 Come this Halloween, slap these Glowing Halloween Slapsticker Beer Bottle Labels on your bottles and serve them to discerning ghouls who will appreciate such a clever brands. Even your soda bottles can dress up for Halloween whenever you apply one of these Glowing Halloween Slapsticker Soda Bottle Labels! Dress your two-liter bottles in these and you will transform mundane soda into wicked drinks. 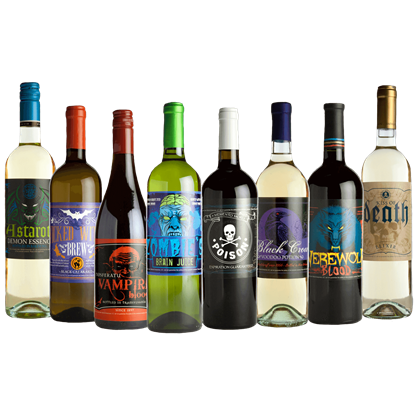 Affix these Glowing Halloween Slapsticker Wine Bottle Labels to your bottles of liquid refreshment and your guests might think twice about their drink. Use these fun stickers to turn all your drinks into ghoulish and fun treats. This gruesome bust recreates the look of a zombie in impressive detail. 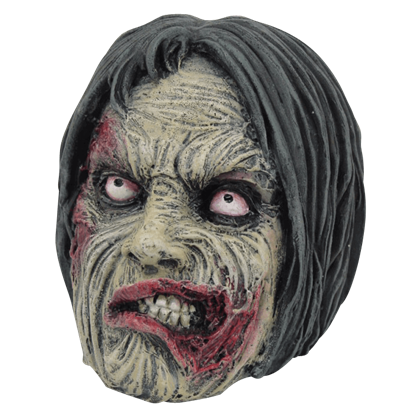 You could say that this Grimacing Zombie Head is quite lifelike, as well as quite safe, as this zombie head will not start snapping at those who get too close. 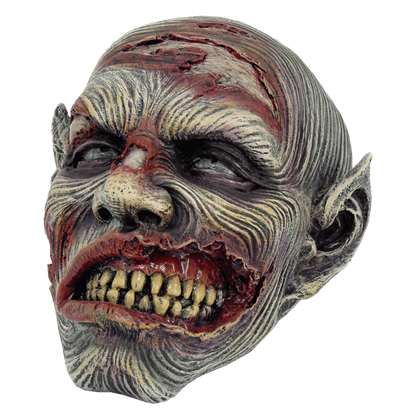 This gruesome bust recreates the look of a zombie in impressive detail. 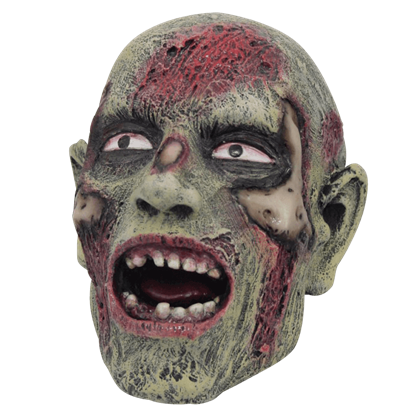 You could say that this Groaning Zombie Head is quite lifelike, as well as quite safe, as this zombie head will not start snapping at those who get too close. This Halloween, do not concern yourself with mundane refreshments. 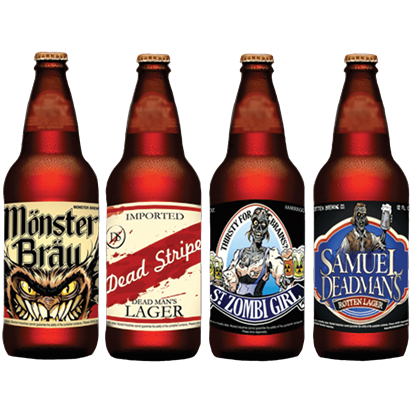 Instead, make sure you drink only the spookiest of beverages by converting all of your bottles into themed drinks with the Halloween Slapsticker Beer Bottle Labels. 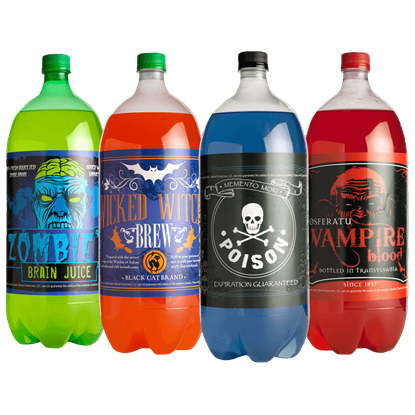 With these Halloween Slapsticker Bottle Labels, you can instantly transform some of your favorite bottled beverages into Halloween drinks. 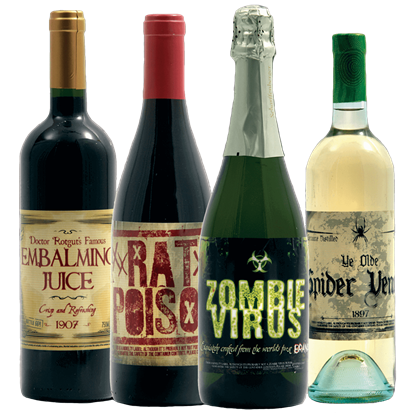 Each label is ghoulishly clever and features a name designed to inspire fright and fun.